In Italy there more than 2000+ varieties of wine grapes, but The Ministry of Agriculture & Forestry authorized only 350 wine grapes. 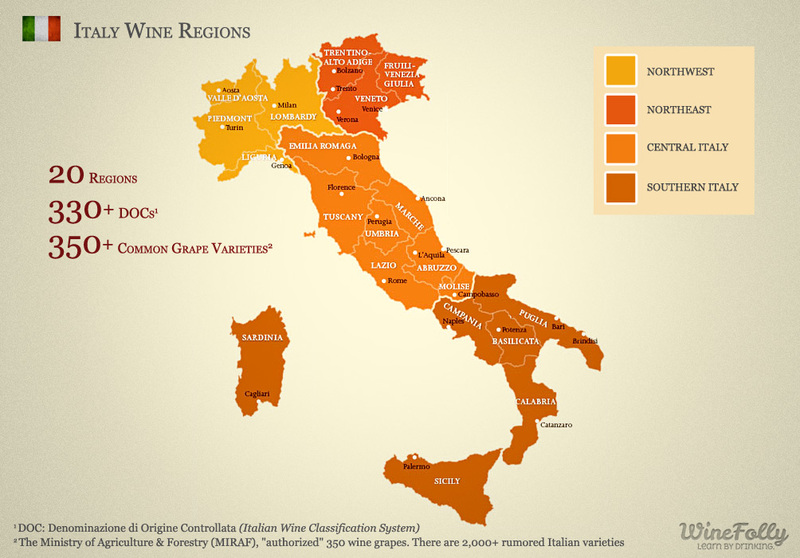 The most popular wine grapes come from Tuscany, Piedmont, Veneto, Lombardy, Sicily, Friuli, and also Apulia and Trentino. Sangiovese: A grape with many names planted throughout Italy. Sangiovese is the main grape of Chianti and Brunello di Montalcino in Toscana. Nebbiolo: A grape that is known for the age–worthy high tannin wines of Barolo and Barbaresco in Piemonte. Barbera: A dark-skinned grape producing wines with lower tannin & high acidity grown mostly in Piemonte, Italy. Lambrusco: A grape and also a region of Emilia-Romagna (and part of Lombardy) that produces a light bubbly red wine of the same name. Montepulciano: A grape grown commonly in Central and Southern Italy. Easily confused with vino Nobile de Montepulciano which is actually Sangiovese from the city of Montepulciano inToscana. Montepuliciano d’Abruzzo is a dark rustic wine with full body, black pepper spice and high tannin. Amarone: A style of wine from Veneto made with a blend of grapes (Corvina, Rondinella and Molinara) that are partially dried to produce a richer, high alcohol wine with a hint of sweetness on the finish. Valpolicella: Ripasso della Valpolicella is a style of wine from Veneto made with three grapes: Corvina, Rondinella and Molinara. Produced by fermenting fresh juice with leftover pomice from Amarone winemaking to add richness. Primitivo: A grape from Southern Italy that is a close relative to Zinfandel. Negroamaro: A Southern Italian wine grape sometimes blended with Primitivo to add tannin and structure. Wines from Puglia that are dominantly Negroamaro include Salice Salento Rosso, Brindisi Rosso and Squinzano Rosso. Pinot Grigio: The most familiar zesty Italian white wine grape of French origin (Pinot Gris). It is actually a Pinot Noir mutant that is a pale red-gray colored grape. It is grown mostly in Alto Adige, Friuli and Lombardy, where it is known as Oltrepò Pavese. Trebbiano: aka Ugni Blanc. Trebbiano is Italy’s most planted white wine grape and is the same grape used to make Cognac and Balsamic Vinegar. Trebbiano is found as a blend in white wines all over Italy. It’s called Orvieto DOC in Umbria. Garganega: The white wine grape that makes up the majority grape in the regional wine called Soave (pronounced “Swah-vey”) in Veneto. Soave Classico DOC is often oaked in a style simliar to oaked Chardonnay with more almond-like aromas. Cortese: The grape in the regional wine called Cortese di Gavi or just Gavi from Piemonte. A light citrus and floral high acid white wine in a similar style to Pinot Grigio or Chablis from France. Verdicchio: A zesty and slightly bitter white wine grape grown most notably in Marche. Also used in Soave where it is called Trebbiano di Soave (not the same as Trebbiano). Fiano: A Southern Italian white wine grape from Campania with floral, citrus and nutty aromas that’s commonly blended in white wines from the region along with Trebbiano. Fiano di Avellino DOCG is 100%. Arneis: A grape from Piemonte region most notable for the regional white wine Roero DOC. Vermentino: A grape from Sardegna and also cultivated commonly in Toscana Bolgheri where is a D.O.C A Vermentino wine is a crisp white, often similar tasting to Sauvignon Blanc with more bitterness not unlike Grapefruit pith. Moscato: Moscato aka Muscat is a very aromatic grape most known for its sweet and bubbly version, Moscato d’Asti from Piemonte. Muller Thurgau: A grape from Trentino with floral and very fruity.